We want your ideas! We’re in the process of evaluating various aspects of CHE’s services and initiatives and generating potential new ones. Given we are indeed a collaborative partnership, your innovative suggestions as to what CHE might do (within our mission, below) to address gaps or needs you see in the environmental health field would be genuinely welcome. To facilitate this, we’re opening this Partner Idea Forum, a platform where you can offer your ideas. This one is interactive in that you can see, respond to and build on other partners’ suggestions. “A good start lasts a lifetime.” That’s what Linda Birnbaum’s mother told her when Birnbaum was growing up. Now Dr. Linda Birnbaum is Director of the National Institute of Environmental Health Sciences and works tirelessly to ensure we all get a good start in life by reducing exposures to toxic chemicals during the prenatal period and on through adolescence—in fact, across the entire lifespan. And that’s what CHE does too. Prevention is at the heart of our work. We know that there are many contributors to a healthy start in life—socioeconomic, psychosocial, gene-environment interactions, nutrition, and so forth. But what is most often left out of the priority list of many excellent programs designed to protect children’s health are chemical contaminants. This means we’re not giving the next generation the greatest possible chance at reaching their fullest potential. By integrating this critical piece, CHE is creating a ‘win-win’ for children, families, and communities. 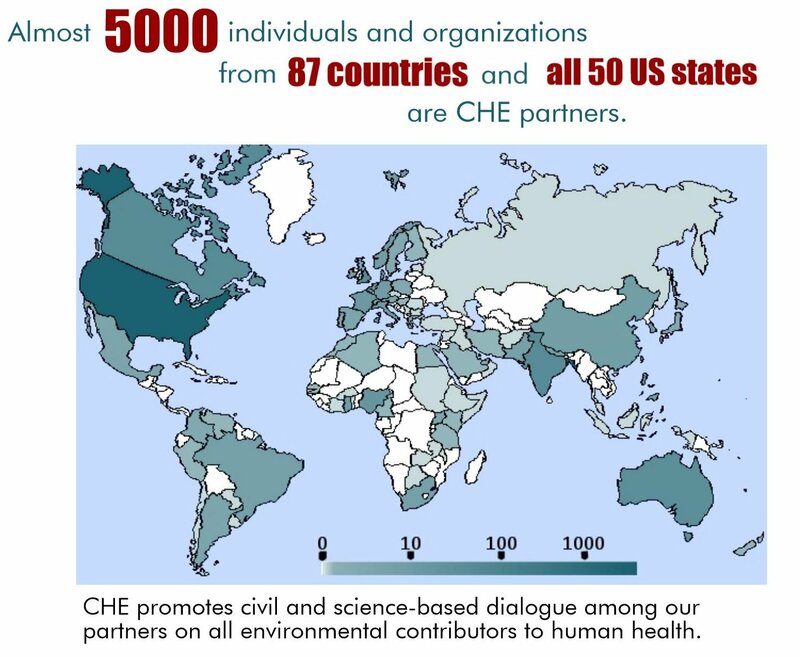 Over this past year, the audio-recordings of our exceptional conference calls on the emerging environmental health science have been downloaded 90,000 times, reaching people concerned with these issues around the world. Our Toxicant and Disease Database continues to be utilized and lauded by those in the federal government as well as researchers, health professionals, and laypeople alike. Our resources on environmental contributors to diabetes/obesity, infertility, cancer, and learning disabilities are consistently accessed on our website. Our publications, such as the “CHE issue” of San Francisco Medicine, the journal of the San Francisco Medical Society, offer useful analyses on cutting edge research and its implications for clinical practice and policy. With your generous donation, we will continue to educate and motivate tens of thousands of scientists, health professionals, health affected groups and concerned citizens across the globe who want to improve public health in their respective countries and local communities. With your generous donation, we will continue our efforts to ensure that all children get the best start possible so that they can enjoy healthy, long and productive lives and see their children, grandchildren and even great grandchildren grow and thrive. P.S. Remember: Donating to CHE is an investment in your children’s and grandchildren’s health—and future. We can no longer relegate social and environmental determinants of health to the sidelines, while deeply investing in pharmaceuticals and gene therapies. Instead, we must work to minimize exposures—from toxic chemicals to psychosocial stress—starting in the womb. By providing this expanded frame for addressing chronic disease and disability, CHE is helping us reimagine and ignite new ways to improve population health for generations to come. As 2013 comes to a close, Dr. Phil Lee, CHE’s founding chair, continues to inspire us. Given his renowned leadership and expertise in public health over the decades, he remains a beacon of light as stormy economic and political forces often obscure scientific evidence and common sense, further undermining our capacity to protect our most vulnerable populations from environmental health insults. Congratulations on receiving the Pacific Southwest EPA’s award for Children’s Environmental Health! What first brought you into environmental health work? I had been working on preconception health care since 1998 when the American College of Obstetricians and Gynecologists, District IX (California) collaborated with the March of Dimes efforts to create guidelines on preconception health to meet Healthy People 2000 goals. The same group of professionals got together as a preconception health council in mid 2000. Reducing preconceptional exposure to chemicals was not part of the plan at the time. Dr. Hani Atrash from the CDC was at the preconception health council, and connected me with Dr. Tracey Woodruff at the UCSF Program on Reproductive Health and the Environment (PRHE). Tracey came to the group and started doing her talks, and I knew we had to address environmental exposures and reproductive health. What is your primary mission in your work? Currently, physicians are not used to incorporating the results of environmental health studies into their clinical practice. More and more research is showing that chemicals and other environmental factors are negatively impacting fertility, pregnancy and fetal development. Clinicians need to be able to access that information, but in a practical way.